Beauty with a Twist: Happy 4th of July! To all my American lovelies, Happy 4th of July! Since the mister is still house-bound due to his cast (and our stairs), we'll be having a low-key holiday. We'll be grilling...on the Foreman grill. Oh the joys of living in an apartment!!! I did however manage to take a few sneaky pics at work of my manicure, I KNOW I should have some red on there, but really I just wanted an excuse to try out China Glaze's Ride the Waves... So I figured, why not a jelly sandwich? This polish is so easy to work with, it's amazing! I went with one coat of Ride the Waves, followed by a coat of Love My Nails in Crystal, and then another thin coat of Ride the Waves. I picked up Love My Nails on one of the few times I'm ever near a Walmart (there are none near me). On another note- when I'm at a Walmart, I haul Hard Candy like crazy! 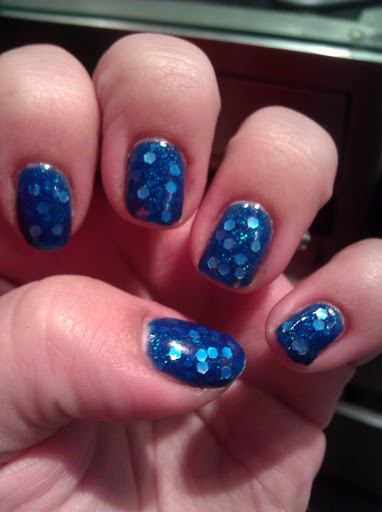 I wish they were carried in other stores... Back to Love My Nails, it contains holo hex glitter and micro glitter. I am certain that this is the biggest hex glitter I've ever come across! What I also loved is that I only needed 1 coat of Poshe to smooth it out, no curling issues at all! Here is a close-up, I love the way the glitter looks embedded in the polish. It also came out super glossy, I couldn't stop look at my hands all day! How are you celebrating today? Got anything fun planned? * a few things I wanted to share with you guys: I've added my instagram feed, so you can keep up with my nonsense (haha). My images are now able to be "pinned" on Pinterest, so feel free to pin away! Also I've added a few affiliate links, just to see what it's all about. I'm not getting paid to promote Lime Crime or Shabby Apple, I only benefit if someone purchases on the sites through the ads placed. Just wanted to disclose that info. Fun!!! This is a great sandwich. I love the color, the shapes, the way it turned out - subtle but unique! Thank you so much! I need to use Crystal more often, I think. Awww, this is the best-looking sandwich I have seen a while - gorgeous! Thank you so much, Maria! 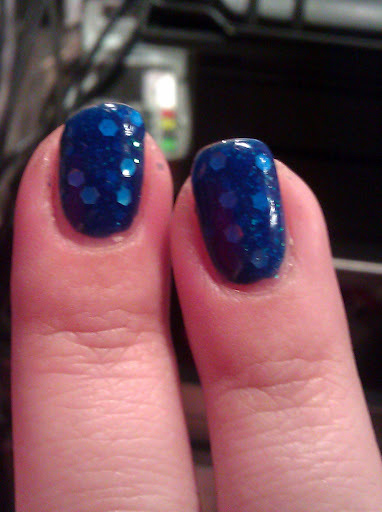 I tried using Pirouette My Whistle but the glitter wasn't bold enough for jelly polish I used. Lovely combo! My first thought before I knew that one of the polishes you used was ride the waves was that looks like water. 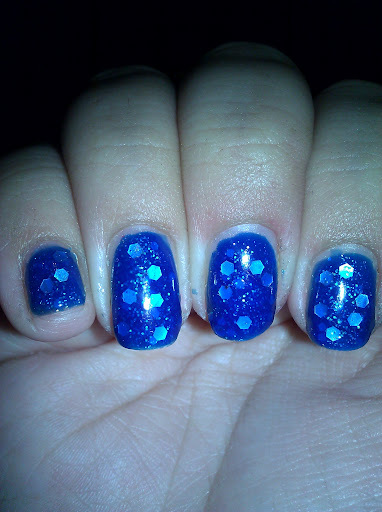 I like polish that reminds me of water for some reason. And I meant to say this earlier but it was great meeting you too a few weeks ago. You should come to Toronto! We have the Edge Walk and ummmm...stuff.